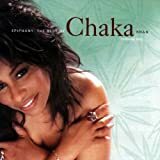 Chaka Khan is amazing, she’s recorded so many great tunes yet somehow this is a fairly recent revelation to me. Everyone knows the hits so I hope I don’t need to educate anyone there and of course you all get down to I Feel For You when it goes the jukebox but have any of you actually listened to the album it’s from in full? No? Then do so immediately, there are some killers on there! Anyway, this is one from 1981 and has a chorus that I can never get out of my head. What a riddim.